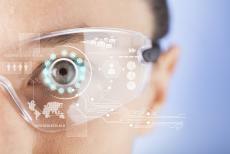 A new pair of Smart glasses could revolutionize the way we interact with our household appliances. All users have to do is blink and they can instantly turn on their lights and even send emails on a computer. Professor Zhong Lin Wang, who teaches at the Georgia Institute of Technology, was the head researcher on this project. Dr. Wang also worked with scientists at the Chinese Academy of Sciences in Beijing. The researchers placed a very thin triboelectric generator around the arms of these hi-tech glasses. This sensor was coated with both polymer layers and metal to effectively scan a person's eyelids. Whenever a user blinks, the polymer layers contract and send out a current of electricity. These electrical messages can be sent both through a cord and wirelessly. Professors are hopeful these glasses can help people with serious neurodegenerative diseases like ALS operate computers, cellphones, and household appliances. One issue some people have had testing out these glasses is that the sensor has a hard time differentiating voluntary and involuntary blinks. The way Wang hopes to solve this problem is by making the glasses only pick up hard deliberate blinks. Wang says users will be able to set the threshold for the switch to activate at very high levels. Although it might be trickier to spell out a message on the computer, these glasses will also help users perform this function. Blinking in rapid succession multiple times will allow people to choose the letters they want to type on mobile devices and computers. Ambarish Ghosh, a professor in the Centre for Nano Science and Engineering at the Indian Institute of Science, said Wang's research looks extremely promising. Mr. Ghosh went on to say that the best thing about this new technology was its "high sensitivity," which could help people who have limited mobility. Wang's interest into this sensor technology goes back to 2013. Back then, Wang successfully showed how triboelectric sensors can collect energy. There's no word yet on when these glasses will ever be released to the general public. Dr. Wang and his colleagues in Beijing now want to test how this sensor works on various muscles throughout the body. This research could lead to massive innovations in the field of robotics. ALS, sometimes called Lou Gehrig's Disease, is a relatively rare nervous system disorder that impacts a person's ability to control his/her muscles. The first warning signs of this disease include muscle weakness, balance problems, trouble swallowing, and unexplained weight loss. Although there's no cure for this disease, there are numerous therapies doctors can use to help ALS patients. Doctors generally prescribe muscle relaxants, glutamate blockers, and schedule physical therapy sessions. More serious cases may require surgical procedures like a gastrostomy or a tracheotomy. Wang's research was printed in the May 2017 edition of Science Advances. The article was published in the "Alternative Energy" section under the title "Ultrastretchable, transparent triboelectric nanogenerator as electronic skin for biomechanical energy harvesting and tactile sensing."